Why are we raising money for Children’s Cancer Research Fund? Because they are on a mission to find a CURE. We have a long way to go to meet our huge goal — to reach $100,000 in lifetime fundraising — so once again, we’re offering a gift to one lucky donor who donates $100 or more between now and MIDNIGHT SUNDAY 6/5. 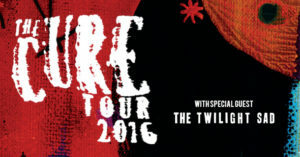 This week, we’re giving away 2 tickets to see The Cure at Xcel on Wednesday 6/7. The Cure for a CURE! ← A big fundraising goal means big appreciation.